Shopping for a high-quality HD webcam for live streams and conference sessions? Here's 4 of the best Mac compatible Hi-Def web camera options for streaming and online teleconferences that deliver superior clarity, light response and color accuracy. If you host Skype, Google, FireTalk, or YouTube Live conferences, you'll want to project the best image possible and stream at high frame rates. Ask any seasoned teleconference host and many will say the Logitech C922 Stream Pro is the new number one choice. This top-quality premium webcam supports H.264 video compression and is optimized for streaming video at high frame-rates. It currently retails around $99 USD. It's premium optical quality lens delivers exceptional image clarity. It far exceeds the color accuracy and sharpness of any Apple iSight camera that might be built into your MacBook, iMac or Apple Cinema Display. Dual microphones cancel echo and noise and deliver good audio response, though many live streaming hosts prefer a dedicated XLR or USB microphone for maximum audio quality. Comparable in video quality to Logitech's premium cameras, the Microsoft LifeCam Pro rivals the C922x with high-quality glass optics, clean sounding microphone, and tripod mount. Also notable is Microsoft's TrueColor technology for accurate color in a wide variety of lighting situations. Another great choice: The Logitech C930e has an even higher megapixel camera sensor - and most notably - a wider-angle field of view (FOV) than most webcams. The 90 degree wide angle is perhaps best for those who have 2 people sitting side-by-side during a streaming video chat since it incorporates more of what's around you in the frame. Most other consumer webcams are in the 70-78 degree FOV range which is better suited for one person at close range. 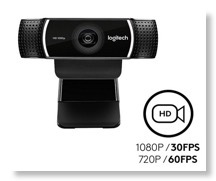 For those wanting high-quality livestream chats on a budget might consider the Logitech C615. This small, portable and folding webcam still delivers a superior HD image, has an optical quality glass lens, and a single high-quality microphone element with built-in noise reduction. At a price around $45 USD, it's an excellent value. Although it doesn't have H.264 compression, with good webcam lighting it offers smooth, high frame rate streams. Although all of these live stream friendly webcam's feature an adjustable mounting clip, you should really take advantage of these webcam's tripod mounting hole for stability and precision placement and angles of your Skype, LiveFire, Google Hangout or YouTube Live teleconferencing session. Low-cost desktop mini-tripods are popular with streaming IM'ers, but depending on your setup, a full-size floor tripod or a desk mounted boom camera arm may be preferable.